With the most extensive plate heat exchanger range, Sondex has the optimal technical solution for any task. The unique inlet designs and plate patterns provide high thermal efficiency and heat transmission for any given pressure drop. Sondex delivers standard, copper brazed, semi-welded and all-welded plate heat exchangers as well as customized heat transfer solutions for any application. Standard Plate Heat Exchangers: Sondex delivers standard plate heat exchangers as well as customized heat transfer solutions for any task. The Sondex plate pattern is designed to solve a variety of different heat exchanger applications. Semi-Welded Plate Heat Exchangers: Semi-welded exchangers are two plates laser welded together to form a cassette. The advantage of this construction is easier site assembly and cleaning with one side of the cassette being a sealed welded channel while the other is a traditional gasketted plate channel. 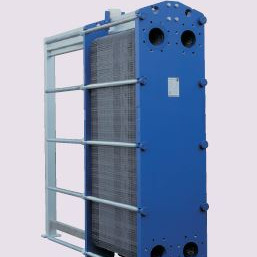 Plate Bank Assemblies: This type of heat exchanger provides a lower purchase cost and smaller footprint while maintaining high heat transfer efficiency. 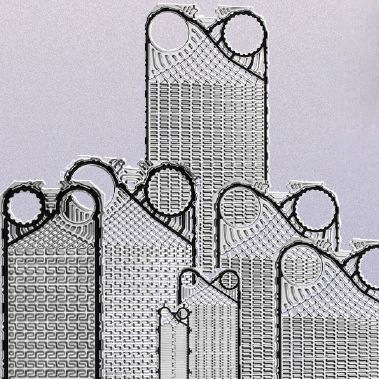 The small plate gaps in the all-welded heat exchangers allow them to operate with very close temperature approaches compared to traditional shell and tube heat exchangers. The no gasket solution in the all-welded heat exchanger makes it suitable for many difficult applications. Free Flow Plate Heat Exchangers: Sondex free flow plates are used for liquids containing solids, particles, fibres or high viscous products. The plates are commonly used in the pulp and paper industry, in waste water treatment plants, the sugar industry, juice production, grain-based ethanol production, heat recovery systems, and in other special tasks where standard plate heat exchangers typically become blocked. Brazed Plate Heat Exchangers: The Sondex brazed plate heat exchanger uses a number of thin acid resistant precision stamped stainless steel plates with copper brazed gaskets. The plate packs are brazed with two end plates and connections. Vacuum brazing at extremely high temperatures provides a permanently sealed heat exchanger. 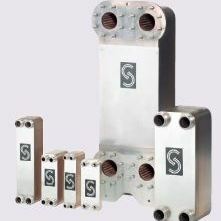 The final result is a strong and compact plate heat exchanger with extremely high heat transfer capability. Plate and Shell Plate Heat Exchangers: Sondex's plate and shell heat exchangers utilize a fully laser/TIG welded plate pack mounted inside a traditional cylindrical shell. With a high thermal efficiency and lower purchase cost, the Sondex plate and shell heat exchanger combines the benefits of a traditional shell and tube type heat exchanger with the high efficiency of a plate type exchanger. Evaporator and Condenser Plates: Sondex's unique evaporator and condenser plates are designed for condensing low temperature vapors and for multistage evaporation of highly concentrated products. The unique asymmetric large port holes provide the optimal exploitation of the available heat transfer area. The unique inlet design and high thermal efficiency make these plates the most efficient in the market today.